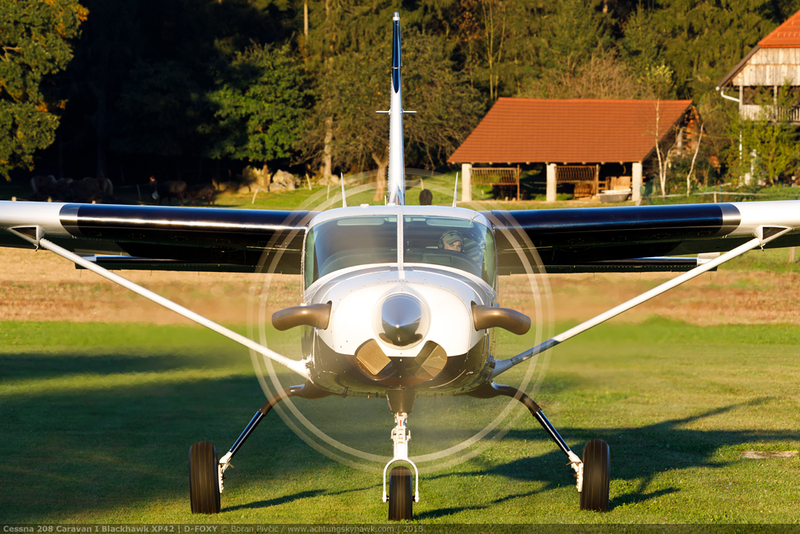 Photo File – My Kingdom For Some Horsepower: The Caravan Blackhawk XP42 | Achtung, Skyhawk! 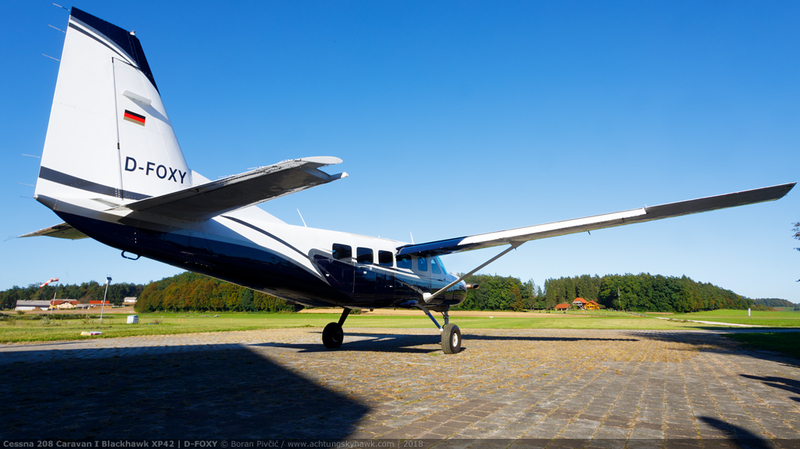 It is perhaps a sign of the state of general aviation on the Balkans that the arrival of a single Cessna Caravan can stir up so much interest that even people from neighboring countries head over to see it. While a perfectly common “garden variety” airplane everywhere else, the 208 is still a pretty exotic beast in these parts, with myself having come across only four examples in the 16 years I’ve spent hanging around light aircraft. Therefore I could be excused for packing up my photo gear and driving 120 km one way to Šentvid Airfield in Slovenia in order to catch it 😀 . The machine in my sights, however, had a bit more going for it than just being a big Cessna with a turbine. On the one hand, it is a comparatively rare short-body Caravan I – and on the other it sports the impressive Blackhawk XP42 engine conversion that is not that common even in the more affluent bits of Europe. 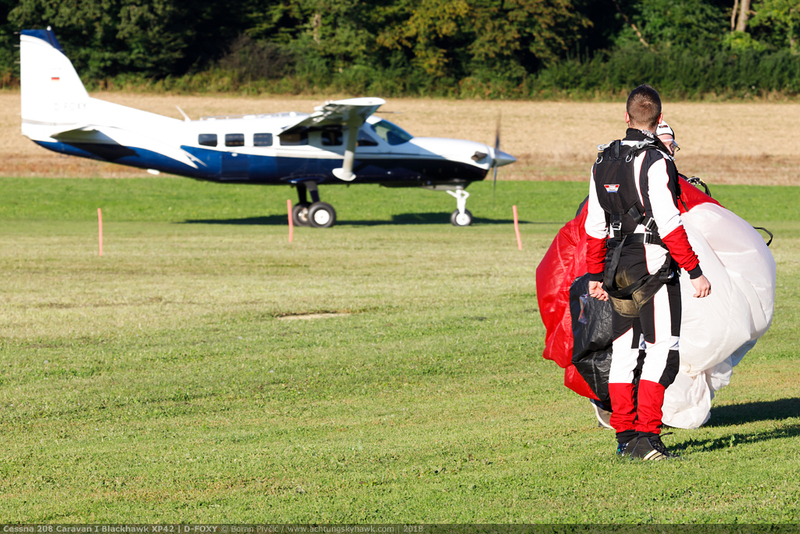 So as it spent its three days there hauling skydivers to altitude, I could take my sweet time and get to know it Achtung, Skyhawk! style 🙂 . Though much can be said about the qualities and exploits of the rugged Caravan, what interested me most in this case was in fact Foxy’s nose job. 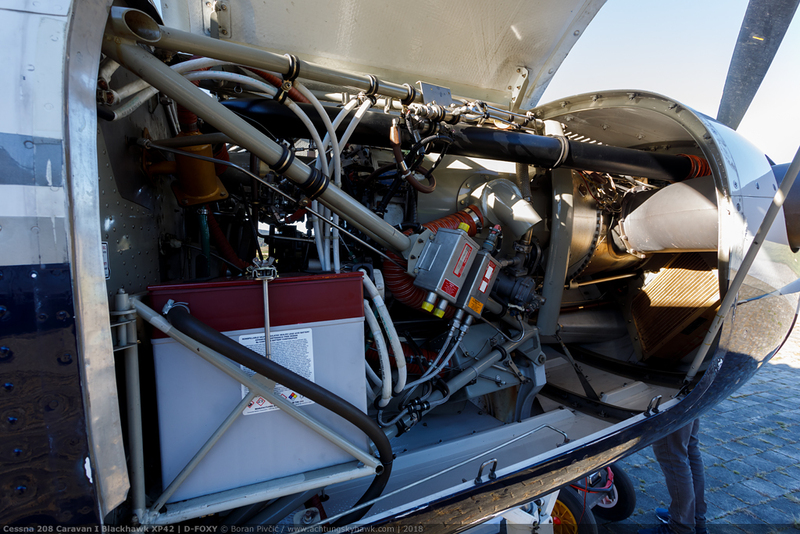 One of the many products to come out of the Blackhawk Engineering works – the people who put third-party turboprop upgrades on the map – the XP42 mod involves replacing the 208’s standard engine (in this instance a “small series” 675 HP PT6A-114A*) with a much more potent “medium series” 850 HP PT6A-42A. In addition to the improved power, the 42’s larger core also noticeably adds to the torque, with take-off figures now up from 2,535 to 3,045 Nm. To soak all this up, the original three-blade 2.69 m McCauley prop gives way to a variety of four- and five-blade aluminum and composite units, with Foxy in particular sporting a conventional 2.54 m Hartzell for a bit of extra ground clearance. * up until serial number 208-00276, most short-body Caravans were powered by the 600 HP PT6A-114 unit. From aircraft 277 onward, they switched to the same 114A as used by the bigger Grand Caravan. Also of note is PW&C’s engine class system: “small series” engines develop between 500 and 900 HP, “medium series” cover the 850-1,050 range – while “large series” go from 750 all the way to 1,900. But, the XP42 upgrade is as much about added grunt as it is about the nature of its delivery. Unlike a simple engine swap, this conversion is what’s called a “firewall forward solution”, which includes – where necessary – extensive modification to the engine compartment itself in order to get the most out of the new powerplant. Since the majority of XP42s will be used for rough-and-tough hauling in arduous conditions, the folks at Blackhawk had gone to some length to make the upgrade more than just a course of steroids. 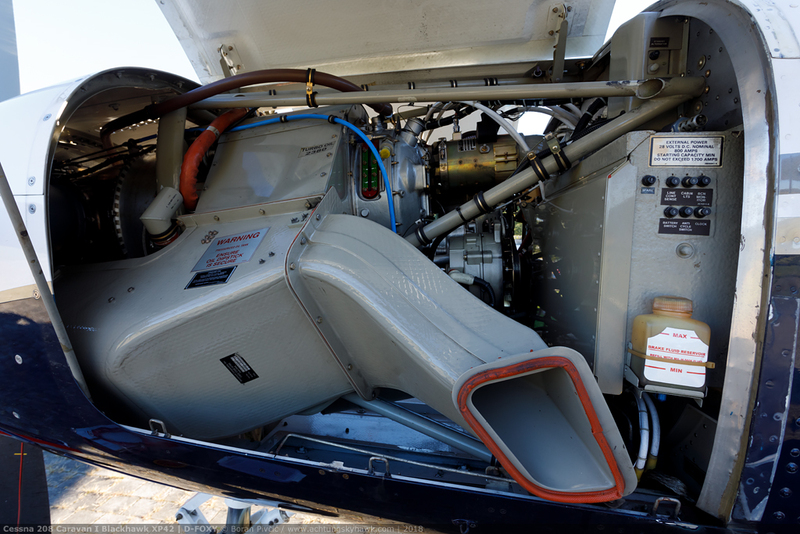 To this end, the most obvious alteration is to the cowl, now widened at the front to accommodate a 40% larger oil cooler in order to keep things in the green even during operations in hot-and-high conditions or repeated back-to-back flight cycles. The new twin exhaust stacks (a consequence of the 42’s slightly different architecture) can be profiled to either eek more thrust out of the exhaust gasses (5 knots worth in fact) – or increase mass flow at the expense of cruising efficiency to lower turbine temperatures during the type of prolonged high-power climb common to skydive ops. Other stuff? Well, the engine is now mounted at four points instead of three, there’s an improved air intake system with a modified inertial separator to further reduce the likelihood of foreign object ingestion at rough strips, the battery is now a Li-ion affair instead of lead/acid to save roughly 13 kg in weight – and there’s an optional 325 A starter generator instead of the stock 200 A unit to reduce wear and tear on the engine by shortening spool up and light up times. 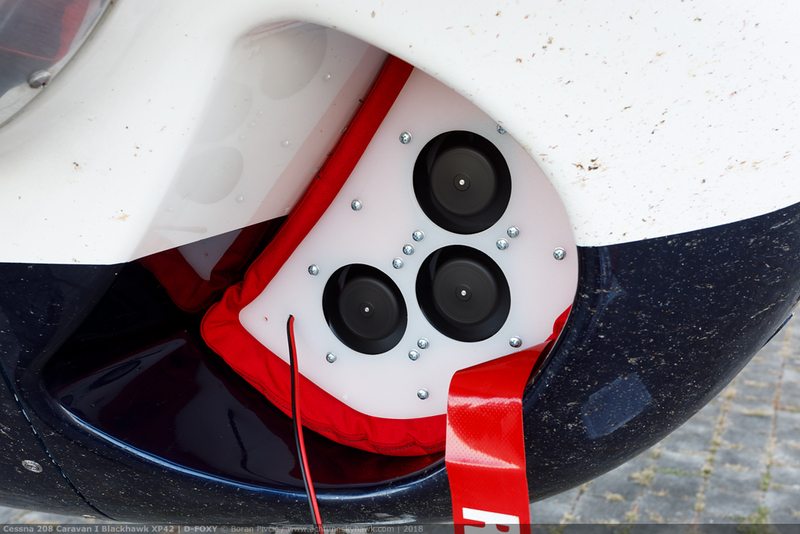 The package is also rounded up by custom Hawkeye engine gauges, generally similar to the Caravan’s originals – but now with an additional digital readout for most parameters. And the conversion’s other party piece, the new oil cooler. A pretty good illustration why the XP42’s nose now looks like it had been rammed into a wall! As always, I would like to thank the very friendly staff at Šentvid Airfield – as well as Foxy’s pilot for allowing me to snoop around the aircraft inside & out! 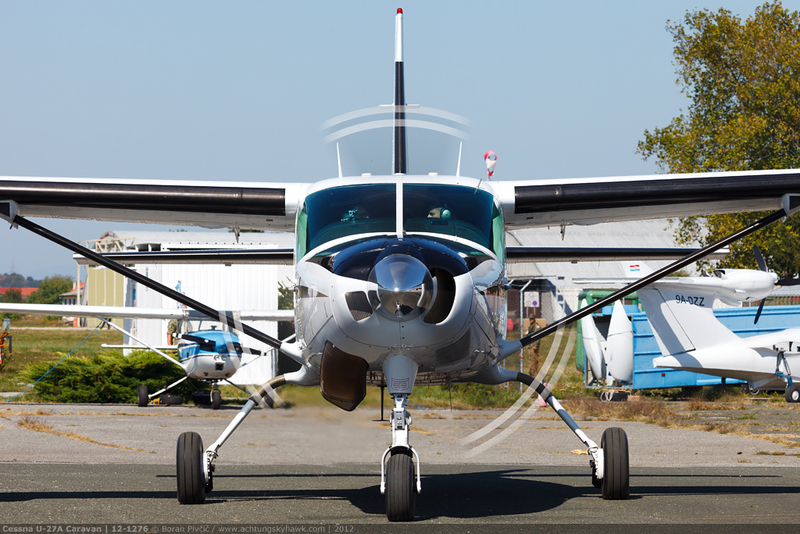 Pingback: Photo File – Pratt My Ride: The PT6 Cessna 206, S5-DOT | Achtung, Skyhawk!